I mentioned I had uses in mind for the Fresh Celery Syrup I made recently, and this is the one at the top of my list of ideas. Luckily, it worked well for last week's TDN: Nuts, as well, so I threw it out for them. 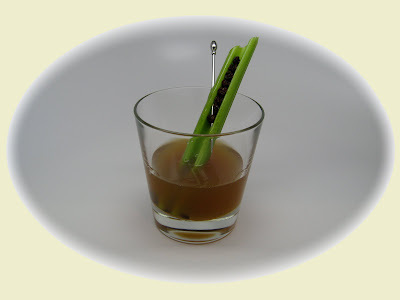 I decided to have some fun with the idea of a cocktail playing off the old childhood staple of peanut butter and raisins on a celery stick, and here's what I ended up with. I really like how the peanut infusion turned out, and I think this is a nice showcase for it. To make it I just took some unsalted and roasted peanuts and soaked them in Bourbon for a couple days and then strained it through a coffee filter. (Actually overnight on the counter and then in the fridge for like 5 days because I went out of town, but it seemed to be pretty forgiving.) Likewise for the currants, although I didn't strain that one and just left 'em in to soak.